Semi-pro Islamophobe Shermon Burgess — aka ‘The Great Aussie Patriot’ (and chief propagandist for the anti-Muslim ‘Reclaim Australia’) — has this weekend teamed up with the tiny neo-Nazi grouplet ‘Nationalist Republican Guard’ in order to launch ‘The Hunt for Andy Fleming’. I assume this means that Burgess & Co are angry and upset at my opposition to their promotion of Islamophobia. This phenomenon, already much-remarked upon (see also : Australian Sikhs say abuse on the rise as they cop Anti-Muslim sentiment, Melanie Kembrey, The Sydney Morning Herald, February 28, 2015), was given a boost a few weeks by the Prime Minister, Tony Abbott, in his address on ‘national security’. Abbott’s remarks have given folks like Burgess and neo-Nazi groups like NRG official license to harass, threaten and intimidate Australian Muslims, a task which they’re pursuing with great vigour. Of course, when the country’s chief legal officer, George Brandis, also proclaims in Parliament that Australians have a right to be bigots, such antics are only to be expected. As for Burgess’s partners in ‘The Hunt’, the main, public figure of NRG is Melbourne-based Neil Luke Erikson. 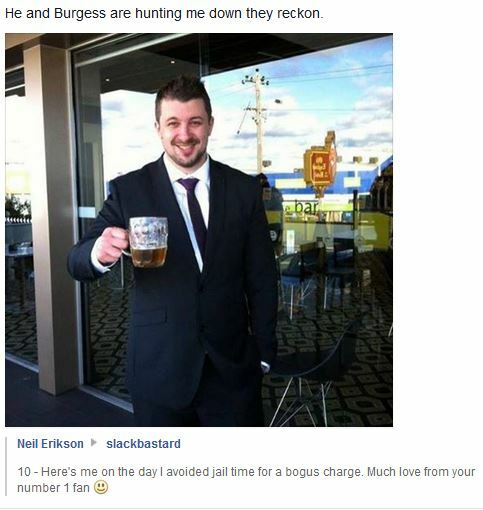 Here’s Neil cheekily celebrating the fact that in February 2014 he escaped a custodial sentence for being naughty on the phone and threatening a local Melbourne rabbi, Dovid Gutnick. 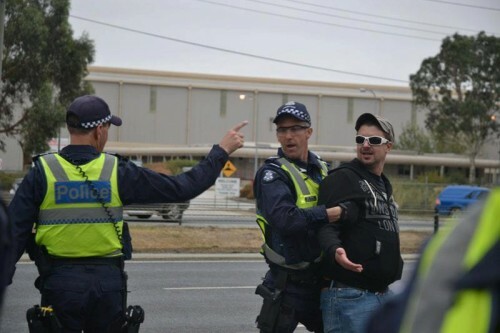 … and finally at the Geert Wilders meeting at La Mirage Receptions in Somerton in February 2013, being escorted away from counter-protesters by police. 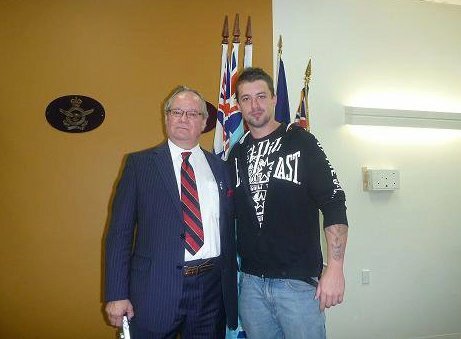 Having already expressed his hatred and contempt for Indigenous Australians, promoted the neo-Nazi group ‘Squadron 88’ (whom he describes as ‘patriots’), advocated the burning of mosques and the murder of Muslims, Burgess is now working together with neo-Nazis to promote both ‘Reclaim Australia’ — and to ‘hunt’ me down. I reckon both Burgess and Erikson have got a few ‘roos loose in the top paddock. 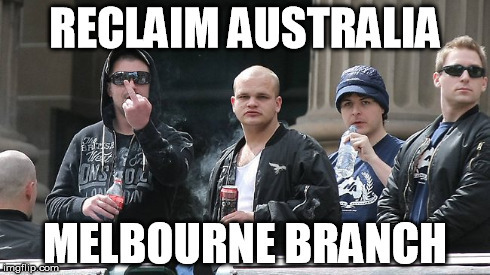 This entry was posted in Anti-fascism and tagged Australian Defence League, European Australian Civil Rights League, Nationalist Alternative, Nationalist Republican Guard, Neil Luke Erikson, Reclaim Australia, Shermon Burgess. Bookmark the permalink. Hopefully they won’t pick someone else at random and decide they’ve ‘unmasked’ Andy.